One former inmate, Doreen Kartinyeri, wrote a book with Sue Anderson, about her cultural heritage and includes data on her time in the Fullarton facility. Dooreen was awarded an honorary doctorate. She passed away in 2007. Like most girls at the Home, she was trained to be a domestic servant. Much was made by the Salvation Army about such training as being a really good thing. However, it merely reflected the low expectations for the inmates. Some of the girls, who were placed with families under the scheme, were subsequently sexually assaulted. The low status was reinforced by descriptions of the girls as “troubled”, “difficult” and “delinquent”, which is typical for the Salvation Army. The Home was usually referred to as a “Probationary School”. Girls who did not toe the line were sent to the Reformatory. This was another typical tactic by the Salvation Army to control inmates. The author remembers the dread inmates felt at the threat of being sent on to the Westbrook Reformatory operated at Toowoomba in Queensland (which was the subject of an enquiry in 1961 for abuses). Records note that the majority of Fullarton girls had been charged with, and convicted for, being neglected children by the State Children’s Court. Records from police stations record entries stating “convicted as a neglected child, sentenced to seven years at…” Some were placed there for truancy or other “troublesome behaviour”. Until the 1960s, a child under 15 found smoking in public could be sentenced to one of these Homes. The Salvation Army has yet to issue a similar apology for its involvement in the “Stolen Generation” scandal. It now uses the old Home building as its administrative headquarters in South Australia. The time people take to get to the point where they can report abuses varies enormously. Sometimes it can be over 40 years. It is likely that, given the lowly status of the inmates of the Fullarton Girls’ Home, more claims will emerge under the impetus of the Royal Commission than have surfaced to date. This entry was posted in Uncategorized and tagged :A World That Is, And Will Be”, Australian Royal Commission into Institutional Responses to Child Sexual Abuse, Doreen Kartinyeri, Fullarton Girls’ Home, Lewin Blazevich, Lewis Blayse, Salvation Army, Salvation Army Fullarton Girls’ Home, Salvation Army Girls’ Home, Stolen generation, Sue Anderson, Was, Westbrook Reformatory. Bookmark the permalink. 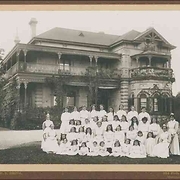 The photo in the article of the girls in front of the building reminds of the movie “Picnic At Hanging Rock”.